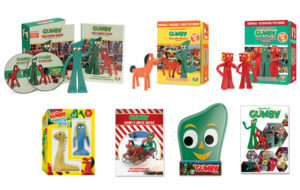 Gumby's on the move! This t-shirt shows multiple Gumby poses and gives the illusion of Gumby moving. Now you can have your very own Gumby camouflage. This cool premium shirt will envelope you in Gumby - it's printed on front and back. Gumby T-Shirt: "I'm Gumby, Darn It!" A spinoff of a timeless saying, this "I'm Gumby Darn It!" t-shirt will certainly bring back memories. 100% pre-shrunk red cotton. Available in Adult, Women's, Juvenile, Youth and more fitted Junior Girls' sizes. Gumby T-Shirt: "Incredible Bendable Gumby"
Kapow! It's the incredible, bendable Gumby! This comic hero style image is printed on a 100% pre-shrunk cotton charcoal gray shirt. This best seller comes in sizes and styles for the entire family: Adult, Juvenile, Youth, Toddler and more fitted Junior Girls sizes. Ever wonder what's on Gumby's mind? This clever tan t-shirt shows some of the many moods of Gumby. Go ahead, take a peek inside this little green guy's clay head. Available in Adult and Youth sizes. 100% pre-shrunk cotton. Gumby T-Shirt: "Kiss Me, I'm Green"
Get your green on! This dark military green colored, 100% pre-shrunk cotton shirt comes in Adult, Youth and more fitted Junior Girls sizes. A playful Gumby and Pokey line drawing dress up this 100% pre-shrunk cotton charcoal gray shirt. Sizes and styles for the entire family: Adult, Juvenile, Youth, Toddler and more fitted Junior Girls sizes. Gumby's super power is his ability to morph into any shape. This shirt celebrates Gumby's stretchiness. A great workout shirt or for everyday wear. "Twisted" has been a perennial best selling t-shirt for Gumby. This version of the twisted concept is printed on a 100% pre-shrunk cotton charcoal gray shirt. Available in sizes for the entire family: Adult, Toddler, Juvenile, Youth, and more fitted Junior Girls sizes. We've also added adult tank tops and long sleeved shirts. Gumby T-Shirt: "U Mad Bro?" The Blockheads are up to no good again! These two troublemakers appear on a 100% pre-shrunk charcoal gray cotton shirt. Available in: Adult, Juvenile, Youth, and more fitted Junior Girls sizes. Gumby Throw Pillow - "Best Friends"
Decorate with Gumby. This fun throw pillow will spice up your space with a touch of modern retro style. Gumby Throw Pillow - "Big Face"
Gumby Throw Pillow - "Chilling"
Get in the Gumby spirit with this fun top hat. Made of soft foam, it's comfy, and the one size fits most adults. Wear it for Halloween, a party, a sporting event, or just to get some attention anytime. The hat color is true Gumby green, but it may appear neon green on your browser. Bendable and flexible, this USB drive with 8 GB of memory is useful and fun! Take it wherever you go--the key chain provides extra security. Every Gumby fan needs one. Take Gumby for a ride. This version of the Gumby bendable figure comes with suction cups for easy mounting inside your car windows. It will stick on any surface appropriate for standard suction cups: the fridge, a mirror, a filing cabinet at work... Gumby's there for you. Our mini bendable Pokeys are now available in bulk. They make great party favors and event giveaways. Minimum order: 25 pieces. Gumby's sidekick. This bendable, posable figure is 4.75" tall. Created in honor of Gumby's 50th birthday, this Pokey was the style and shape from the 1960's. Pokey is bendable and posable. He stands 4.75" tall. This premium costume pairs well with Gumby - a great option for couples. Adult standard size. Holiday Pokey cheer! No tree is complete without this fun and flexible mini Pokey ornament. It's a great companion to the Gumby ornament. At just under 3" tall, this Pokey figure is bendable and posable. It also comes with a suction cup for easy mounting on glass or metal. Hit the road with Pokey. This Pokey key chain will keep your keys safe. Bendable and posable, he's is fun to play with, too. Approximately 2.5" tall. 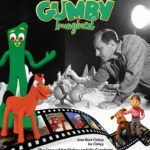 The Adventures of Gumby, the 1960s Series, Volume 1, collector's edition includes 220 minutes of wild Gumby adventures in the original episode lengths as first aired in the 60s with their original soundtracks. It also features a 1960's style bendable Pokey toy. You've never seen Gumby like this before! The Adventures of Gumby, the 1960s Series, Volume 2, collector's edition includes 220 minutes of fun Gumby adventures in the original episode lengths as first aired in the 60s with their original soundtracks. Plus, two Blockheads bendable toys are in the box! You've never seen Gumby like this before!